David Brower wants to empty Lake Powell; trail builder Gudy Gaskill visits. Post election musings by a Western Democrat consider why Republicans won so easily and what new strategies environmentalists need to learn. Dogs vs. grizzlies in Glacier N.P. ; deer in gardens; squirrel steals keys; growth in Colo., and FDR on trial in school; Imnaha, Ore., holds Bear & Rattlesnake Feed; "Floating Preference" want ad; Enid Greene plans book; boom & bust with Smokey Bear. What happened at elections, Phyllis Becktell leaves HCN, something familiar, communications. In Durango, Colo., passions about A-LP still run high - with former Mayor Jeff Morrissey cited by police for harassing two anti-A-LP women. Colorado's Animas-La Plata project - the last of the big BuRec projects, and the most mired in controvery - is tackled by opponents and proponents who seek consensus. Longtime HCN reader Ann Phillips is an educational consultant turned archaeologist. "Utopian Vistas: The Mabel Dodge Luhan House and the American Counterculture" by Lois Palken Rudnick is reviewed. Rebuilt hwy floods Murray, Idaho; canned salmon endangered by consumers; faithful rats; dark side of Grand Junction, Colo.; wolves harass skiers in Washington; Rep. Charles Taylor loses wager on logging; religiously segregated Colorado cemetery. HCN board meeting in Driggs, Idaho; Writers on the Range at HCN; fall visitors; research fund drive; correction. Mining and sea-captaining in Vail; Boy Scouts stone California bear; mountain lions chase mountain bikers and domestic pets; illegal immigrants disrespectful of horse trailer; park volunteers; tourist railroad billed for forest fire. The Cody, Wyo., "Boobyprise"; Andy Kerr a controversial columnist for Oregon's "Wallowa Chieftain"; Immigration raids disrupt Jackson, Wyo., tourist season; unexpected balloon adventure in Vail, Colo.; grizzly that mauled a man in Glacier Nat'l Park. Bikers invade Steamboat Springs, Vail Ski Area expansion, unusual parade in Casper, Wyo., Forest Service bills campers for fire in N.M., stupid tourist remarks, Gov. Gary Johnson thinks there are wolves in N.M., fun things to do at Western Planners Conf. The firing of Colorado River Water Conservation District secretary-engineer Rolly Fischer after 28 years marks the end of a profligate era. Paonia's Cherry Days festival, summer visitors, corrections, and Mollie Beattie, U.S. Fish & Wildlife head, dies of cancer at age 49, also obituary for Harley Greiman by Ed Marston. What seems on the surface to be a successful consensus effort to restore grizzlies to central Idaho and western Montana has provoked a bitter split among Northern Rockies environmentalists many of whom believe the plan will harm bears rather than help. 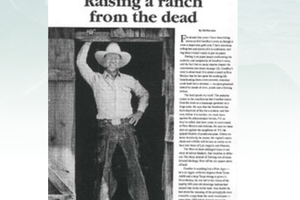 Sid Goodloe, in his own words, discusses how to be a good steward of the land while making a living at ranching. Author and fire historian Stephen Pyne talks about the role of fire in the Southwestern landscape. Western university biologists and botanists dispute Goodloe's theories - from several viewpoints. Rancher Sid Goodloe battles pinon-juniper and uses a variety of controversial methods to restore his ranchland in New Mexico. Corrections, it's easy to run HCN, visitors, remembering James Gould Bradley, Colorado conferences. Navajo football broadcast, George Nethercutt not a good listener, fish visitors comment, Wanaleiya resort in Nevada, Iowa romance, cold weather in the Dakotas, big and little DIAs. Colorado Springs board meeting, long-range planning, index and superindex, Tony Davis wins award, Adam Duerk recovers from fall. Pizza-eating wolf, Crow Nation loses rights to Big Horn Nat'l Forest, football in Lyman, Wyo., retirement benefits for Alan Simpson and Pat Schroeder, Linda Hasselstrom overhears conversation about Jackson and Wyoming, taxi drivers at DIA. In his own words, an anonymous retired East Coast businessman explains his disillusionment with the West and his decision not to buy property there. Small town getting too big; four-wheel drive dangers; economic whimpers from Los Alamos; political wackiness in the NW; carting salmon around Elk Creek Dam; thrifty farmers; Navajo language wins wars; snakes in Navajo schools. The Old West and the New West need to work together in trying to preserve the far-from-pristine West that still remains.